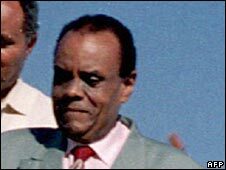 Former Sudanese President Ahmed al-Mirghani has died in Egypt aged 67. He was swept from office 19 years ago in a coup that brought the current government to power. His was the first democratic government of Sudan. It was in power from 1986 to 1989, before current President Omar al-Bashir seized power in a coup. One of his most notable achievement in office was to sign a peace deal in 1988 with John Garang, the leader of a rebellion in southern Sudan. Mr Mirghani also served as ambassador to Cairo and was president of the Sudanese Islamic Bank. The cause of his death is unclear. His body is due to be flown from Egypt to Khartoum for burial later this week.